The last few days have kept me in the warm kitchen, amidst the sweet and spicy smells of Autumn. 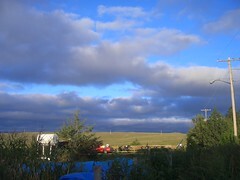 We had our first frost in the wee morning hours of the 19th of September. 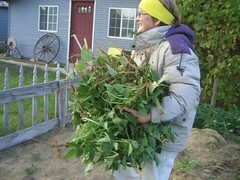 We knew it was coming, from the still chill of the air and cool colors in the sky AND the weather report, so the garden's bounty was picked (or covered) to save it from icy death. 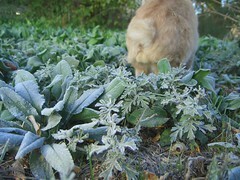 Most of the garden in town was surrendered to the frost. 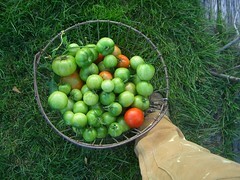 I picked all the tomatoes and now have a countertop covered in green ones, slowly ripening [stems down is apparently the proper way]. 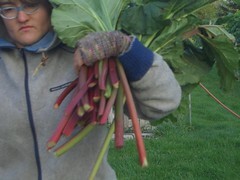 I also cut most of the rhubarb and mom pulled up the green bean plants, to pick inside where it was warm. 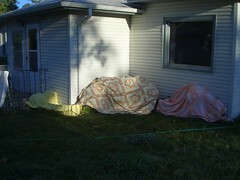 I wasn't ready to lose my little caprese bed, so I covered it with blankets the night before. The next morning was chill and sparkling. The spots of grass where the sun had yet to reach were crunchy underfoot, our steps leaving green footprints on a field of frosting. I love these kind of mornings. As all the green turns to brown over the next few months, the white frosted mornings will become even more special, turning the dull brown world into a bright and shimmering (temporary) fairyland. 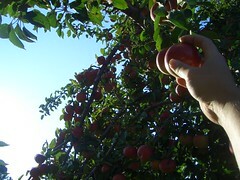 Luckily, I'd picked apples a few days before, or we'd never had gotten everything picked in time. I harvested apples on a warm, windy afternoon - a perfectly Fall activity that was extremely satisfying. 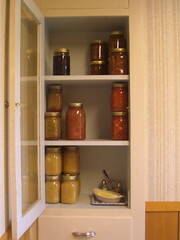 The apple trees in town were just LOADED this year and despite numerous batches of applesauce and chutney, I've barely made a dent in their abundance. 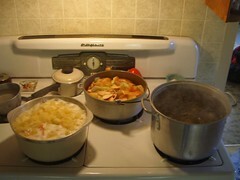 My grandma taught me to make applesauce her way (the right way) in this kitchen, on this same old stove that love. She never cooked the apples so long that they became complete mush - and heaven forbid that nonsense about using a food processor to puree the sauce. 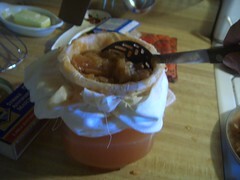 I detest store-bought applesauce with it's perfectly even consistency - yuck. So I cooked up a few batches of applesauce, using the apples soon to spoil (partially worm or bird eaten), and canned most of it to enjoy later. 2. Add 'just enough' water to the apples. Adding water until you can just just barely see it through the apples is a fairly good rule of thumb. Fresher apples require less water, in general. 3. Place on medium heat and cover the top with sugar. I suppose a reasonable ratio of sugar to apples would be 1:5. But remember, you can always taste it later on and add more, so definitely err on the side of too little. 4. 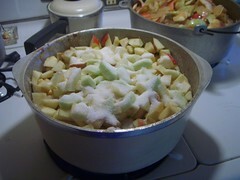 Cook apples at a simmer (or a boil if you're impatient like me) until they reach the desired consistency. This could be anywhere from 30 minutes to 2 hours. My preference is to put on a pot full of apples and then once they have reduced by about a quarter or so, I add as many more freshly chopped apples as I can. This way, though the majority of apples may get good and mushy, there will at least be a few that are left more or less whole and comparatively firm. In my opinion, you should cook the apples at least until they become somewhat transparent. 5. Grandma seasoned her applesauce with only cinnamon and sugar. I could imagine that orange rind or allspice might also be nice. Perhaps you have other ideas for inclusions. 6. 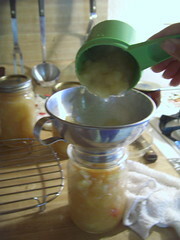 To can the applesauce, pour the still-hot sauce into sterile jars, [top with a teaspoon of lemon juice, to prevent browning], wipe the rims, place the seal, screw on the cap, and process in a boiling water bath for 10 minutes. 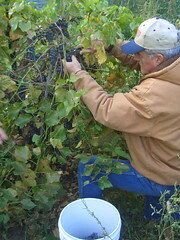 The other hurry-and-harvest item was the grapes in Mom and Dad's yard. We had hopes of making ice wine with them by crushing frozen grapes, extracting only the intensely-flavored sugary parts of the grape and leaving behind the watery frozen parts. It takes a tremendous amount of pressure to accomplish this type of crush, and ice-wine presses being restrictively expensive, we finally decided to just make wine (the regular way). After de-stemming and crushing them all by hand (only about 10 gallons, but still! ), I decided that a crusher/de-stemmer would be at the top of our 'Necessary Equipment' list for next year. Since we picked them so late, the Brix (sugar content) is pretty high and they are not as acidic as you'd like. Next year I plan to test the sugar and acidity of each variety continually as they ripen, so that eventually we'll be able to pick each variety at the moment when these two factors are most optimized. I bet there are old-timers who can 'test' for these factors simply by tasting the grapes. I guess that would be the way to turn this 'science' into more of an 'art'. Being in this house this time of year is flooding my everyday moments with memories from my childhood. 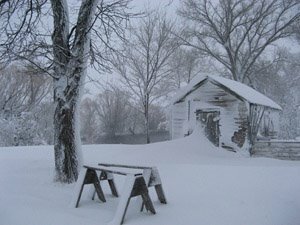 I guess that I'd never really spent much time in the house during the warmer months, so most of my memories in this house are of the Fall and Winter. Sitting in front of the heater when it clangs to life, turning rotisserie-style to get all warmed up. Planning meals to utilize the oven as much as possible, in order to keep the kitchen nice and warm (I'm discovering a new respect and delight for casseroles...go figure). Sudden enthusiasm for indoor projects like sewing and cleaning. Though I've been living here for four months now, I think this weather will coax me to finally MOVE IN to this house. 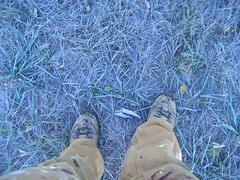 Wow, first frost and New York is still humid and hot. I can't wait for it to break. Why don't you print off some nice labels for that there applesauce and preserves and ship some out for us to sell at the farmers market when you visit? Imagine - we could sit behind a table with our scarves and smile at customers and sell just a few, till we get tired of it. SOOOOOOOOO badass, yet my fave pic is the cute one of you on the floor curled up with your laptop. It's like a total contradiction. I love it!